never stopped for us to disembark to see the constitution. Don't take the last boat. so for me it was a waste of money. Truly amazing still commissioned ship, manned by current Navy personnel. I would have enjoyed it more if there had been a guided tour, rather than just being able to ask ask questions, when you could get through the crowd to a person. Perhaps a sign up for an in-depth tour for us history buffs? I would be willing to pay for that. I was expecting to go cruising on the USS Constitution. This is NOT a cruise on the USS Constitution. 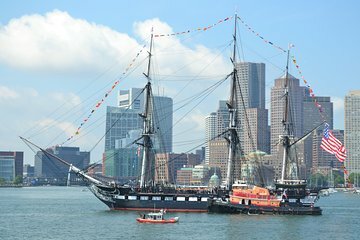 This is a cruise on a boat that takes you PAST the USS Constitution, and you can stop at the Charlestown Yard to see some of the activity there and catch the next boat back. Quite misleading. This was unfortunately one that was very misleading. This is not a cruise on the USS Constitution at all, as the name implies. We rode over on a medium-sized boat to the navy yard and disembarked. The USS Constitution was in dry dock, something this company should know beforehand so they can tell people, oh, but perhaps they do that on purpose because then they might lose sales??? My suggestion, take the 3.25 per person ferry over to the navy yard and see the USS Constitution which is in dry dock until next July and see the USS Cason Young while you are there. Beautiful weather! Greg and Bob are amazing tour guides. One of the highlights of our trip! Glorious Day! Great way to start your Boston adventure. All went as expected. A good harbor tour. Easy access to the harbor area made this trip a good orientation for us. We learned that there is also a water ferry that goes to Charleston from Long Warf leaving every 30 minutes for 3.50. The day after our harbor tour, we took the ferry over one afternoon so we could get off and tour the USS Constitution. We thoroughly enjoyed the tour. The guide that we had was unusually good in that he was both entertaining and informative. The only reason I give the tour 4 stars is that the water potion of the tour was relatively brief and not too informative. Very nice and relaxing. No guides on board which make it less appealing. The personal touch is always best I think.